Keeping personal information secure and having the freedom to access content without restrictions are crucial aspects for internet users. Privacy is under attack and online crime is on the rise, which is why there is a high demand for services that offer security and that allow us to enjoy internet without restrictions. That is why VPNs are so popular and there are several providers available, giving customers more options to find a service that is right for them. If you still haven’t found the best VPN service for your needs, perhaps it’s time to check GOOSE VPN, a Dutch VPN that was launched in 2016 and that is making a great first impression. They offer high quality software, ease of use and a website that is engaging and that shows how passionate they are about their service. 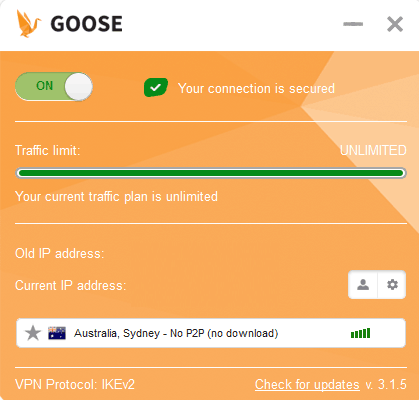 The protocols supported by GOOSE VPN are OpenVPN, which is open-source, reliable and provides a high level of security and IKEv2, an option that offers good connection speeds and that works very well with mobile devices. As of May 2017, Goose released updated their clients to support PPTP and L2TP protocols, although not as secure as the previous options. To ensure that your online traffic is truly secure, GOOSE VPN applies 256-bit AES encryption with SHA-256. This high standard of security will protect your communications and prevent internet criminals, snoopers or your ISP, from monitoring your online activities. Whenever you travel or need to connect to public Wi-Fi hotspots, you can rely on GOOSE VPN to secure your connection and avoid online threats. The fact that GOOSE VPN is based in the Netherlands, allows the provider to take a solid approach to privacy. VPNs are not subject to mandatory data retention in the Netherlands and the country is known for its commitment to privacy and online freedom. GOOSE VPN doesn’t keep logs of your online activities, the servers you connect to, or your IP. They do log how much bandwidth is used per account, but this to keep track of usage since the basic accounts have a data limit of 50GB per month. 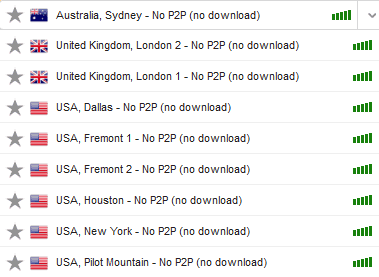 If you are a fan of torrenting, you’ll be glad to know that GOOSE supports P2P in a selection of servers. Being a newbie in the industry, GOOSE VPN understand the importance of making things simple for beginners. The installation process doesn’t have any complications and even if you don’t have technical knowledge, or previous experience, you will be able to get the VPN up and running in just a matter of seconds. They have dedicated clients for Windows, Mac, Android and iOS, making the set up process on these platforms a breeze. Customers also get access to manuals and instructions to install the VPN on NAS and routers, The software is modern, well-designed and user-friendly. While it is fairly basic and doesn’t offer advanced features, this is precisely what makes it ideal for customers who want a solution that is simple and effective. Although at the moment, other platforms like Linux are not supported, it is likely that GOOSE will expand the compatibility of its software in the future. The provider only started its service in 2016, but it is already gaining recognition for its commitment to offer a reliable solution to stay safe and to get the most out of internet. Their network of 62+ servers currently covers over 30 countries including Canada, Hong Kong, United States, Netherlands, Australia, Russia, United Kingdom, Romania, Austria, India, Finland and Spain. The servers where P2P is allowed are clearly marked so you can easily select an option for this purpose. GOOSE VPN already covers key countries that will allow you to access great content such as the US and the UK, but since the network is regularly being updated, we can expect more locations to be added soon. GOOSE VPN stands out for offering the possibility of using as many simultaneous connections as you want. This unlimited support will suit customers who won several devices. One thing to keep in mind is that if you opt for a plan that has limited data (50GB), your allowance would be over quicker if you use multiple devices at the same time. In terms of speed, GOOSE VPN provides good performance in general. A slower connection can be expected when you use OpenVPN, due to the high level of encryption, but in general, you will be able to stream, download, browse or play games without experiencing significant speed loss. As we previously mentioned, there is a plan that offers up to 50GB and while you can use as many devices as you want, this may decrease your data faster. Apart from that downside, this option offers access to all the servers and features and it costs only $2.99 per month. If you prefer not to have any data restrictions, you can upgrade to the Unlimited GOOSE plan. It costs $12.99 per month or just $4.99 per month, if you pay for a full year in advance. One of the benefits of choosing GOOSE VPN is that it gives you the chance to enjoy the first month of service for free and if you are happy with the service, the monthly fee of the plan you selected, will be taken automatically once the 30 days have passed. If you choose to cancel, you can contact the support team within 30 days. There are multiple payments methods supported, including most major credit cards, PayPal, Giropay and IDEAL, which is popular in Netherlands. They even support Bitcoin for the more privacy conscious user (only currently available with an annual plan). The Support section on the website includes a comprehensive FAQ that covers different aspects of the service and that provides clear and detailed information. If you need additional help, you can use the web form on the website or contact the support team via email. Although there is no live chat available at the moment, GOOSE VPN usually replies within a couple of hours and the responses are clear and address any queries effectively. You can also reach out to them on Facebook or Twitter. GOOSE VPN hasn’t been around for long in the VPN industry, but it is clear that it is going in the right direction and are striving to continually improve their service and add new servers. The service is appealing and will help new VPN users to discover how easy it can be to secure their connection and bypass restrictions. We are happy to see they recently added support for Linux and Bitcoin as method of payment. GOOSE VPN looks very promising and its service is an easy to use and effective solution.